The jobless rate ticked down to 3.8% in May, another sign of the strong economy and tight labor market. That tied the lowest unemployment rate since 1969. Since then, the only other time unemployment was this low was in April 2000. "It fell for all the right reasons. We had more people coming into the labor market. We saw employers digging deeper into the pool of unemployed," said Josh Wright, chief economist at the software firm iCIMS. The jobs report painted a picture of an economy with opportunities for almost everyone. Black unemployment fell to a record low, and the gap between black and white unemployment shrank to the narrowest ever measured. Job openings are at a record high, and businesses are hungry for workers. That has helped underrepresented Americans find jobs. The unemployment rate among African-Americans and Asian-Americans has been steadily declining. It has also dropped among low-education workers and even teenagers. Over the past year, the unemployment rate among 16- to 19-year-olds has fallen from 14.1% to 12.8%. Economists believe that the unemployment rate can dip even further because there's still slack in the job market. The employed percentage of America's population stands at 60.4%, still well below pre-recession levels. 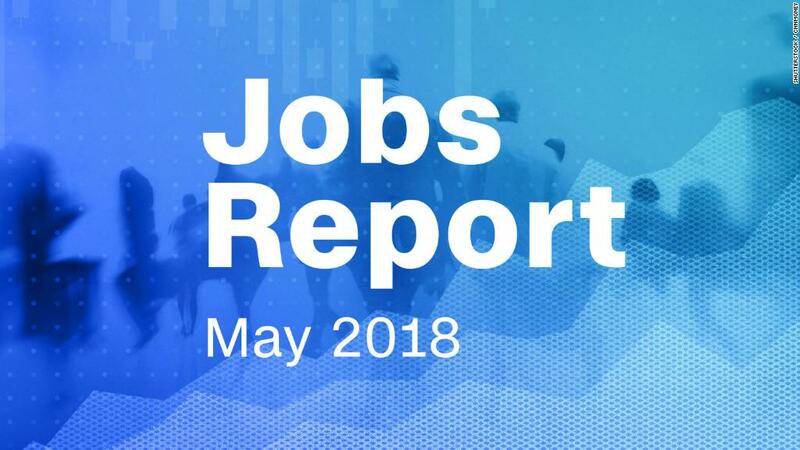 Despite questions about employers' ability to find qualified workers, the economy added 223,000 jobs in May, better than economists predicted. Job gains were broad. The retail, health care and construction sectors added the most positions. The economy has added 207,000 jobs a month this year on average, a faster pace than last year. "The US economy has this incredible head of steam," Wright said. The economy has been expanding for almost nine years, the second-longest streak on record. And employers have added jobs every month for seven and a half years, a record. Modest wage growth remains the great puzzle in the economy. Wages are 2.7% higher than a year earlier. Although wage growth has picked up in recent months, economists have been puzzled for a long time about why pay isn't climbing faster. In a job market this tight, employers are typically forced to pay much more to attract workers. In 2000, the last time unemployment was this low, wages grew at a pace of about 4%. Productivity and inflation are lower than in previous periods of growth, and economists believe that has kept a lid on wages. The erosion of workers' bargaining power has also played a role. Another explanation: Employers are turning to new workers — such as younger people and those just re-entering the job market — to fill positions vacated by better-paid veteran workers who are either retiring or taking new positions elsewhere. Economists are confident that wages will keep climbing as competition for workers grows. Dozens of companies have already announced pay hikes and more attractive benefits to lure workers. On Thursday, Costco said it would raise starting wages for US employees by $1, to a minimum of $14 an hour. A little more than an hour before the jobs report was released, President Trump broke with precedent by saying on Twitter, "Looking forward to seeing the employment numbers at 8:30 this morning." Trump's tweet seemed to move the markets. Bond yields jumped almost immediately, and the dollar moved higher. The jobs report is kept under wraps until the Labor Department publishes it at 8:30 a.m. ET, in part so investors can't get a jump on the data before it becomes public. A federal rule says executive branch employees are not supposed to comment on major economic reports until an hour after they are released. "Trump's tweet clearly violated prior norms of practice. For markets to do their best work, they need clear rules of the road to ensure fair competition and invite broad participation," Wright said.